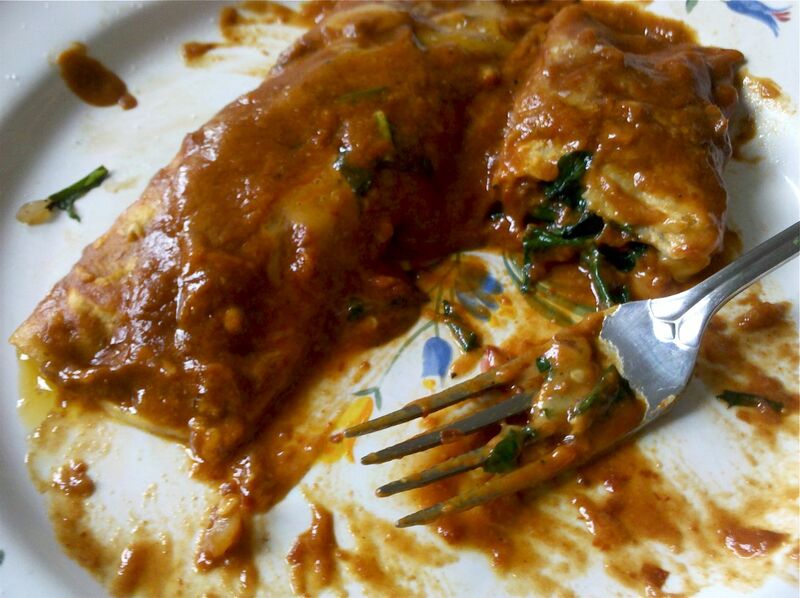 My friend Dan chatted me during a boring day at the office last week asking what I thought of this recipe for enchilada sauce. Dan’s a smart cookie. He knows where to come for an honest opinion from an expert (if I do say so myself) Mexican-food enthusiast. My humble list of street creds start (first and foremost) with my blood – half Mexican, half Lebanese – a Lebican. I grew up camped on the floor of various kitchens belonging to my Mexican-American relatives, very happily playing with my toy kitchen set while the aroma of rich spices like cumin and cilantro wafted through the air while my mother, nana, tata, aunts or cousins prepared large Mexican meals to be enjoyed by family and friends. Second, my father (the Lebanese one) owned a Mexican restaurant. I never really figured out why the Lebanese parent owned and ran the Mexican restaurant, but it didn’t really matter because the food was out of this world and the most popular in Phoenix. Which brings us to number three – I hail from the Southwest and have had the good fortune to not only sample regional Mexican food in my native Sonoran desert, but have traveled all over getting my fill of Baja, New Mexican, Oaxacan, à la veracruzana, and most unfortunately, Tex-Mex cuisine (all of which never lives up to my Nana’s cooking). So Dan does not ask me for advice out of nowhere. He knows what he is getting into when he asks me for my opinion. Sadly for Dan, this recipe did not live up to my standards. I am sorry, but any recipe for red enchilada sauce that does not start with dried chiles is a complete crock to me. Luckily for Dan, I called my mother up and asked her to relay once again (because she’s already told me 100 times since I moved out to New York) how to make her enchilada sauce that she learned how to make from my Nana. Dan headed home with a great recipe and, knowing what a great cook Dan is, probably came away with an amazing enchilada dish to rival some of the best Mexican food restaurants in town. But his question lingered with me all day. So instead of going home and eating a salad or bowl of soup for dinner like one who is about to gorge herself on beer for two days should do, I chose to go home and whip up some enchiladas for myself. Note: I tend to do this. That is, get excited about a recipe or ingredient and the next thing you know I am running through the contents of my fridge in my head or planning a grocery trip in the middle of the day, completely ignoring all other responsibilities. See here or here. Don’t judge. Tell me this – what’s more important than food? So I pulled out that bag of dried ancho chiles I had lying around my pantry for, I don’t know, years, and got busy. It’s amazing to me that 99% of the time I have all of the ingredients on hand to make cheese enchiladas. Because really, there are only a few key elements besides chiles – cheese, tortillas, and a handful of any add in fillings you prefer (mine were cheese with cilantro and green onion, but see list below with ideas). Within a half an hour I was eating homemade enchiladas. But I do have to admit, there is one step in enchilada-making that I just find impractical when making the dish for one – rolling a bunch of enchiladas and baking them in a baking dish for another 20-30 minutes. Awesome when you need to cook for a crowd. Not so awesome when you want to make one or two servings in a tiny NYC kitchen with a faulty, problem-prone oven. Hence, I have updated the recipe below with instructions for a skillet-version that I found as equally satisfying as the baked variety. See? I am not a stickler on everything. Enjoy! If you liked this post, check out A Recipe for Posole from a Real Mexican here. Heat oil in a medium pot or skillet. Add flour and whisk to combine, creating a roux. Whisk constantly for about five minutes, or until the roux has a blonde color. Add red chili paste, stir, and dilute with about 1/2 cup water; add salt to taste. Simmer for about five minutes more, until you can taste the garlic and oregano. You will notice the sauce will thicken considerably. Turn of heat and set sauce aside. Mix cheese and green onion together well. In the bottom of a wide, heated skillet, warm each tortilla until too hot to touch with your hands. Transfer each tortilla to a clean kitchen towel, stacking them to keep warm. Turn down the heat under the skillet but keep warm. Working with one tortilla at a time, put about three tablespoons of cheese mixture in a row in the center of the tortilla and roll tightly. Place rolled enchilada, seam side down, in the skillet. Repeat with remaining tortillas and cheese. Pour enough enchilada sauce over the tortillas to cover almost the whole way up. Simmer over medium-low heat, covered, for about 5 minutes, or until the cheese is melted. Divide among two plates, sprinkle with cilantro and ENJOY! Removed stems (and seeds if you do not have a high-spice tolerance), wash chiles under cold water. Plan in a medium pot, cover with water and bring to a boil. Remove from heat and cover. Let the chiles stand in the hot water until softened, about 20 minutes. Place in blender (or use immersion blender) with garlic and oregano, adding enough of the chile water to liquefy into a medium-thin paste (think the consistency of mustard). There should not be any chunks of peel or seeds left. Makes about 8 cups. You can freeze what you do not need in freezer-safe ziplock bags for up to a year. Note: You can use this sauce to make chili con carne as well. 1) Mix 1 cup of drained, frozen spinach to the cheese mixture. 3) Cut out 1/2 cup of cheese, sub with 1/2 cup corn or 1/2 finely chopped zucchini or yellow squash sautéed in a bit of butter to wilt. 4) Breakfast variety! Fill tortillas with scrambled eggs, chorizo, and cheese. YUMMY!!! Sweet Pea – I prefer the term “Mexanese”. I worked in a Mexican-Lebanese restaurant in Hutchinson, KS back in the late 70’s. Wonderful food. The father was Lebanese and the mom was Mexican. I stayed in touch with the dad for a few years after I moved to Florida but finally lost touch. Will always remember how much I learned about great healthy Lebanese food and great-tasting Mexican. I live in Phoenix. Is your family’s restaurant still in business? If so, please reply with the name so we can check it out! Unfortunately it’s long since gone out of business, but every day we consider starting up a new venture. should i be using regular oregano or mexican oregano? Hollie – Mexican if possible, but whatever on hand will do. Thanks for your question! I used to live in SCA and there was an outstanding mexican restaurant there called El Charro’s. They had the absolute best beef enchiladas I’ve ever had, but the sauce was not tomato based. In fact, none of their sauces were tomato-ey except the salsa. The enchilada sauce looked almost like like beef gravy and had the most heavenly taste which I cannot describe, even if I tried. It was “warm not hot” and didn’t hide the taste of those lovely homemade corn tortillas with the cheese floating around all over the place. Do you have a recipe for anything like that, or is the red chili paste rather a brownish color? I’m pretty sure their’s had some sort of cacao in it or maybe even was closer to a mole (?). Whatever they used it was delicious and I cannot for the life of me get used to the junk served in the tex-mex joints in america. Suggestions for what they might have been making? Thanks for any ideas.